331 Features: -Pump.-Perfect for boosting water pressure, draining hot water tanks and general water transfer.-Not intended for permanent installations.-0.75'' Brass garden hose connectors.-Glass reinforced thermoplastic impeller.-Large prime plug with internal funnel design easy priming.-Easily replaced motor brushes.-Maximum suction lift of 180''.-Thermally protected.-Engine HP: 1/2.-RPM: 7500.-Power cord: 240''.-Maximum fluid temperature: 135 F. Color/Finish: -Durable epoxy powder coat finish. 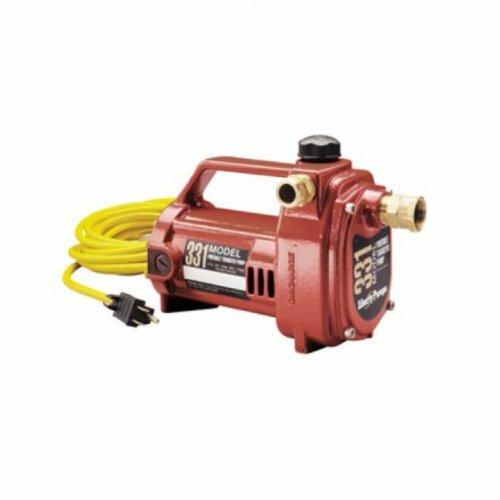 Specifications: -Include: One-piece cast aluminum pump and motor housing with integral carry handle, permanently lubricated bearings, convenient on / off switch, powerful 0.5 hp motor capable of pumping to over 1200'' of head.-115 Volts / 60 Hz / 8 Amps motor. Dimensions: -Dimensions: 7'' H x 4.5'' W x 9.75'' D. Warranty: -2-Year warranty. If you have any questions about this product by Liberty Pumps, contact us by completing and submitting the form below. If you are looking for a specif part number, please include it with your message. © 2019 - scrantonsewer.org. All Rights Reserved.